Budget 2018: Will the government do what it takes? Will the Government do what it takes to fix years of neglect? We all know the education system needs repair, but how much will it cost? 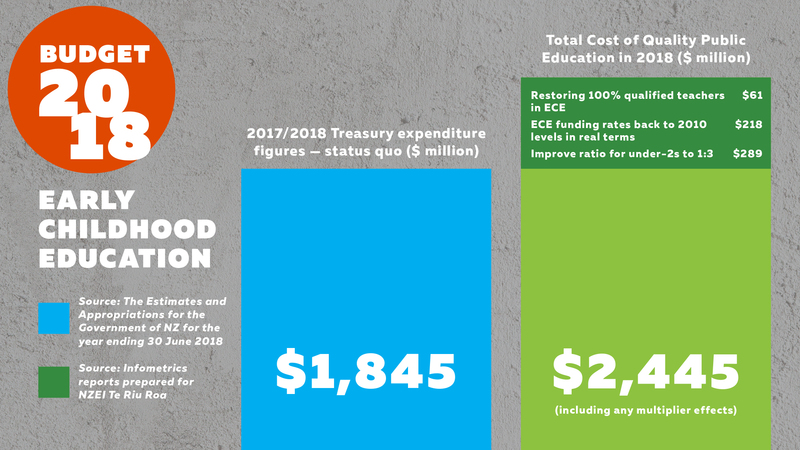 Earlier this month, NZEI commissioned economic analysis company Infometrics to confirm our costings for the steps needed to fix a decade of funding neglect in early childhood and primary education.They’ve confirmed our costings. See the breakdown below, including our full reports. There is so much more that needs to be done in education, but these improvements will make the biggest difference in quality learning for our children and get us in a strong position to work on future needs. Yesterday, the Council of Trade Unions revealed that 92% of New Zealanders believe public services need more funding and an overwhelming majority of 65% back more taxes to pay for it. 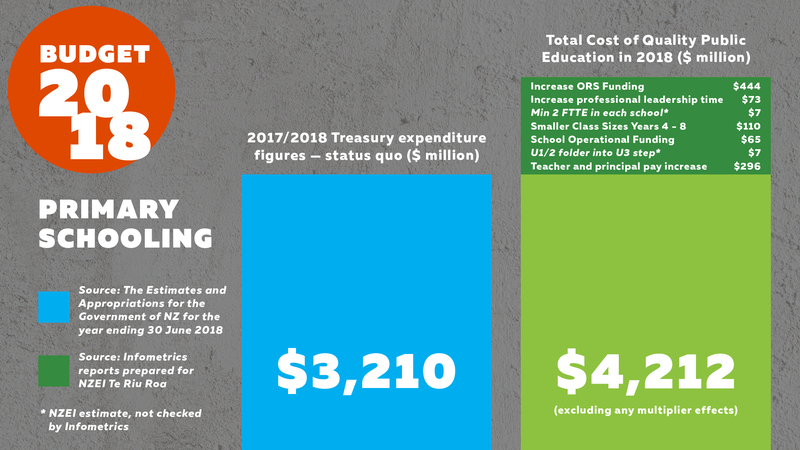 A recent NZEI public poll also demonstrated public support for increased spending on education, with 91% supporting more Government spending on education. If the Government needs to increase taxes or loosen the terms of their self-imposed Budget Responsibility Rules, then we believe they have the public mandate to do so. The foundations of education have been damaged by underfunding for too long. Our new Government needs to find the resources to fix them. This coming Thursday the new Labour Coalition Government will release their first budget. Keep an eye out for our analysis of what this means for you, and whether the right steps are being taken to address the issues we are facing. Infometrics report—commissioned in 2017. Infometrics advises that there is no substantive cost change since then.